51 ⅞ x 90 ½ in. Born and educated in Philadelphia, Edmund Darch Lewis studied painting for only a short time before he began exhibiting at the Pennsylvania Academy of the Fine Arts and later at the National Academy of Design in New York. He quickly became one of the most popular painters in Philadelphia, specializing in landscapes and marine scenes of New England. This monumental painting highlighting Mount Washington in North Central New Hampshire is sublime and picturesque in its grandeur. The placid, timeless scene depicts the majesty and power of nature and evokes the doctrine of Manifest Destiny that motivated settlers to explore America's frontiers. The heroic landscape appears virtually unspoiled by human encroachment, yet signs of taming the wilderness are evident in the well-traveled path, the cleared land, the grazing cows, and the inclusion of two fishermen. 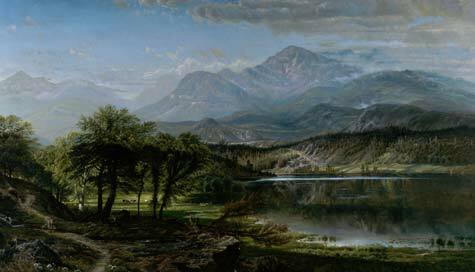 Lewis followed the 19th-century formula for landscapes by depicting a foreground, middleground, and background receding into infinity. The preparatory sketch done on-site for this panoramic view can be found in the Edmund Darch Lewis Sketchbook Collection at The Athenaeum in Philadelphia.